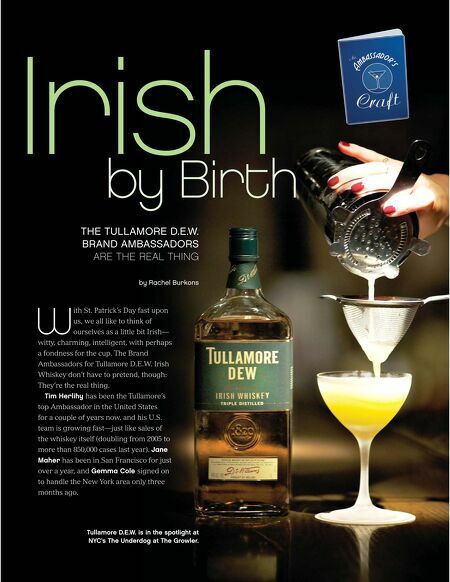 1 14 / the tasting panel / march 2014 by Birth Irish THE TULLAMORE D.E.W. BRAND AMBASSADORS ARE THE REAL THING Tullamore D.E.W. is in the spotlight at NYC's The Underdog at The Growler. by Rachel Burkons W ith St. Patrick's Day fast upon us, we all like to think of ourselves as a little bit Irish— witty, charming, intelligent, with perhaps a fondness for the cup. The Brand Ambassadors for Tullamore D.E.W. Irish Whiskey don't have to pretend, though: They're the real thing. 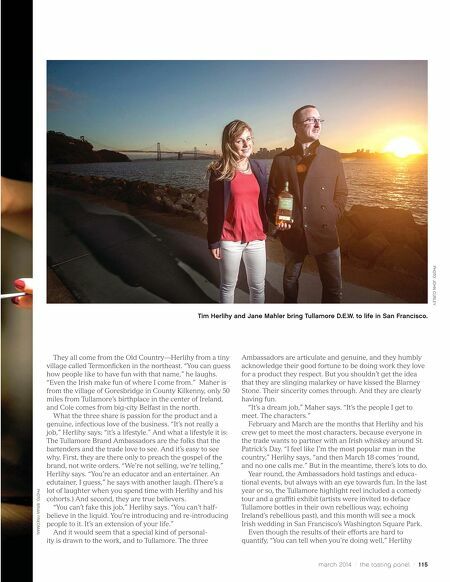 Tim Herlihy has been the Tullamore's top Ambassador in the United States for a couple of years now, and his U.S. team is growing fast—just like sales of the whiskey itself (doubling from 2005 to more than 850,000 cases last year). Jane Maher has been in San Francisco for just over a year, and Gemma Cole signed on to handle the New York area only three months ago.